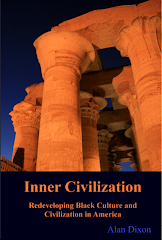 Inner Civilization: Where Does it Begin? As we all now know, Ancient Egyptians built the pyramids. Some have speculated that it was built by slaves, or aliens or gods from another world but recent archeological discoveries point to very human albeit very intelligent origins. The accuracy of the pyramid's workmanship is such that the four sides of the base have a mean error of only 58 millimeters in length. The base is horizontal and flat to within 21 mm. The sides of the square base are closely aligned to the four cardinal compass points based on true north, not magnetic north. The Great Pyramid is located at the exact centre of the Earth's land mass. That is, its East-West axis corresponds to the longest land parallel across the Earth, passing through Africa, Asia, and America. It is made up of 2.3 million limestone blocks weighing an average of 2-3 tons each. Modern architects have stated that while the acceptable settle factor of a modern skyscraper is 6 inches per hundred years, the Pyramid – using more construction material than 35 Empire State Buildings – has settled less than ½ inch in 5000 years. The pyramid remained the tallest man-made structure in the world for over 3,800 years. It is still the largest human construction in the world. Scholars speculated the Egyptians didn’t have the math to do this. However the math is in the buildings themselves. 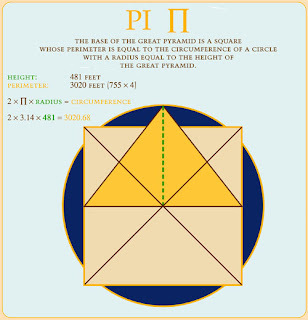 Scholars are becoming increasingly aware that along with so many other Egyptian temples, the pyramids are 3-dimensional expressions of spiritual, scientific and mathematical principles. In addition, the Rhind Papyrus - dating back to 1650 BC - was discovered and partially translated. 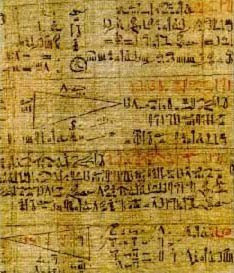 It is a written example of Egyptian mathematical problems and equations. How and why were the Pyramids built? In 1995, Robert Bauval realized that the relative sizes, and detailed positioning of, the Giza pyramids were a faithful representation of the stars forming the ’belt’ in the constellation of Orion. The astronomer Virginia Trimble noticed in 1964 that the southern shaft of the King's chamber points to Orion. The shaft pointed exactly to the star that the Great Pyramid represents in Orion's belt. The southern shaft of the Queen's Chamber pointed at the brightest star in the sky, Sirius, at almost the same time. And Sirius is the representation of Isis, who was the sister and great love of Osiris. 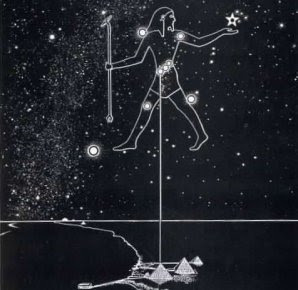 To the Ancient Egyptians, who mapped the constellations, Orion is also Osiris. Osiris is one of the oldest gods for whom records have been found. In Ancient Egypt Orion was known as The Soul of Osiris. Traditionally Osiris is considered to be the Lord of the Two Lands Upper and Lower Egpyt and Lord and Lord of the of the Heavens and Lord of the Earth, representing the fusing of the physical and spiritual realms. Osiris, in his supreme form, symbolizes the immortality of the soul, past, present and future. He is the death experience of the physical body of the past, and the hope of eternal life in the present and future. 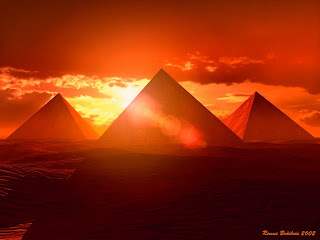 The Giza Pyramids in this context are a representation of the connection between the heavens and the earth.